NASHVILLE, TN — The American Red Cross is issuing a call for platelet and type O negative and AB blood donors to make an appointment to give after severe winter weather in some parts of the country caused about 250 Red Cross blood drives to cancel in March, resulting in more than 8,500 uncollected blood and platelet donations. Platelets, type O negative blood and type AB plasma are three of the most in-demand blood products by hospitals. Those who give can help patients locally or across the country as the Red Cross has the ability to move blood products where and when they are needed most. Donations help patients like Brady Prosser. He was severely burned in October while mowing near burning leaves. He received regular – sometimes daily – blood and plasma transfusions during his hospitalization. Platelets are tiny cells in blood that form clots and stop bleeding. Although they are needed for many reasons, cancer patients often rely on platelets during treatment. Platelets must be transfused within just five days after donation, making steady donations an important component of patient care. By giving platelets, donors can help patients kick cancer. Type O negative blood can be transfused to patients with any blood type and is often needed in emergency situations when there isn’t time to determine a patient’s blood type. 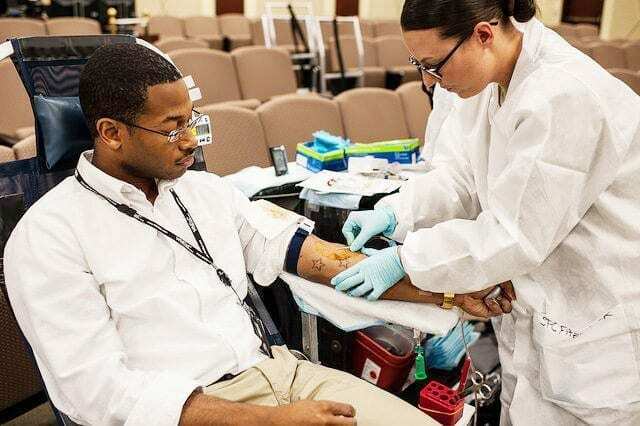 While less than 7 percent of the U.S. population has type O negative blood, hospitals depend on frequent O negative donations to ensure it’s always available for patients in need. Type O negative blood donors are an important part of the Red Cross trauma team. Type AB is the universal plasma type and can be transfused to patients of any blood type in an emergency. Plasma helps maintain blood pressure and supplies critical proteins for clotting and immunity. Plasma can be donated through a blood or platelet donation, or through a plasma-only donation where available. Eligible donors can learn more, find a donation opportunity and schedule an appointment by using the free Blood Donor App, visiting redcrossblood.org or calling 1-800-RED CROSS (1-800-733-2767). A blood donor card or driver’s license or two other forms of identification are required at check-in. Individuals who are 17 years of age in most states (16 with parental consent where allowed by state law), weigh at least 110 pounds and are in generally good health may be eligible to donate blood. High school students and other donors 18 years of age and younger also have to meet certain height and weight requirements. Blood donors can save time at their donation appointment by using RapidPass to complete their pre-donation reading and health history questionnaire online, on the day of their donation, prior to arriving at the blood drive. To get started and learn more, visit redcrossblood.org/RapidPass and follow the instructions on the site.